Kirill, please tell us what goals you want to achieve and what surprises from PAL await armwrestling fans? Our number one goal, which corresponds to all marketing laws, is the maximum dissemination of information about armwrestling and our event in particular. Simply put, about our sport should learn as many people as possible. 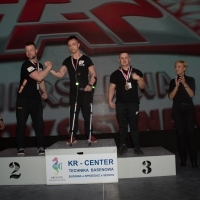 The next step - those who are interested in our favorite sport, should come to Poland or purchase a subscription to the live broadcast of the Vendetta and the “Zloty Tur” World Cup and see the true face of professional arm wrestling with their own eyes. The second global goal of PAL is to combine the efforts of athletes and amateurs of armwrestling in promoting our sport discipline. Today, the main resource of armwrestling is people and their enthusiasm. Sport is very lacking financial resources - sponsors, investors, donors, as well as funds from paid broadcasts of interesting events. For the influx of money in armwrestling, more regular events with more coverage and involvement of spectators are needed. Armwrestling needs more athletes with a worldwide reputation, not only within the community, but also beyond it. And this requires money. It turns out a vicious circle. In order to break this circle, it is necessary to exert threefold more effort and then the sport will become a truly mass sports discipline, which will be of interest to business and ordinary viewers. Therefore, PAL, in the context of the anniversary Vendetta promotion, creates tools for more effective interaction of amateurs of armwrestling in promoting sport in general. If we invest money in advertising, give it to social networks and Google, then why do not we forward them to our like-minded people who are promoting the sport and will be happy to receive a reward for it. For example, our referral program for Armbets TV already brings award to those who registered in it and adds a personal link to their posts and videos. For earned points, everyone has the opportunity to purchase sporting goods and cool t-shirts in our www.armfight.eu online store. During the first month of the program, many were able to earn points equal to more than $ 150. For these points, many acquire Mazurenko's handles for training and access to the broadcast of Vendetta. One of the important advantages of armwrestling is a rather low entry threshold in comparison with other sports disciplines. However, the standard professional armwrestling table is still not cheap. The strongest arm wrestlers, who successfully earn a living by sport, can afford to buy a good, reliable, safe table. But amateurs, children's organizations, schools, do not always have this opportunity. It is for this reason that we create conditions that enable the legendary athletes, participating in the promotion of the event at which they will pull, to redirect a part of collected funds to purchase tables and equipment for children, disabled people, sports clubs, organizations that need help. So the participants of VENDETTA ALL STARS №50 received personal referral links, through which 5 dollars of every purchase of the Vendetta broadcast go to buying tables for charity purposes. We invite everyone to help their beloved athletes distribute these links as widely as possible. In late September, October and at the event itself three professional Mazurenko Equipment tables will be played among all who has already purchased a subscription to the broadcast of VENDETTA ALL STARS №50! Moreover, whoever has time to purchase the access code right now, will be able to take part in all three raffles. Broadcasts are bought every day and the number of participants increases. So in the last draw there will be the maximum number of participants. Therefore, I recommend hurrying and taking part in the September 28 draw, where the competition will be as low as possible. IMPORTANT! Those who received their access codes with gift certificate, should activate them as soon as possible to take part in the drawing. To activate the code, log in to Armbets TV under your login and click on your name in the upper right menu. Select "Enter access code". If you purchased access directly on the www.armbets.tv, you do not need to do anything, you’re all set. By purchasing discount access, you can also take part in 3 table draws. Take advantage of this opportunity, such a price for Vendetta will not be offered anymore. To date, all our promotions have a very high conversion and we are grateful to all our friends and partners who help us promote armwrestling. All these tools will work after the event, so our sport is guaranteed to get double acceleration.